The domain is a simple name of your website which represents your business on the internet, people also identified you on the server via your domain name. You have to think before selecting any domain name. 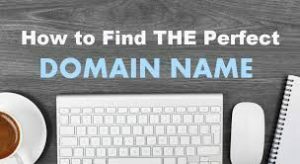 Choosing a domain name is refer that you want to buy a domain name but you are confused what will suitable and perfect for you, here I am going to about some tips that you have to remember these points at the time if buying the domain name for the website. It means you have to select the domain name that’s easy to type and easy to guess online like if you want to start a small business which will relate to pharmacy then you should choose domain name something related medical keyword and meta tags. Try to choose domain name in short because it helps to remember and type in the text field. You should try to Find short and simple. You should avoid numbers and special character at the time of choosing domain name because it will make complication to remember users/customers. Make sure that your name is not copyrighted or trademarked by any third party it will make you complicated the search result on google. You should ignore similar domain name and copyright as well as possible. Extensions are suffixes to your business choose one of respectively which will define your website clearly among of users. Now you can buy/ registrar your domain name bases of these points quickly. I have coded a website. How do I host it?